The British Powerboat Racing Club (BPRC) closed the doors on entries at midnight yesterday into the Cowes Classic 2016. Last weekend’s ‘deadline’ saw a flurry of activity as last minute entrants filled out entry forms and parted with cash. Vector Martini Racing, the winner of the last two Cowes Torquay Cowes races entered their 42′ Mercury powered Ocke Mannerfelt designed hull last Saturday. First we must finish the race. The UIM Marathon Class A fleet that Dredge will be racing against will be very competitive, although there was disappointment that Mikko Oikari didn’t enter his quadruple FPT powered Outerlimits boat. The problem is the canopy. Dean Gibbs had built the boat to UIM 2010 regulations that classified the boat as ‘open’ without the hatches mounted. Martin Purnell (BPRC Chief Scruitineer) has told me it is classified as ‘partial canopy’ per the rule changes in 2012. There is no chance to fulfil the requirements in time. 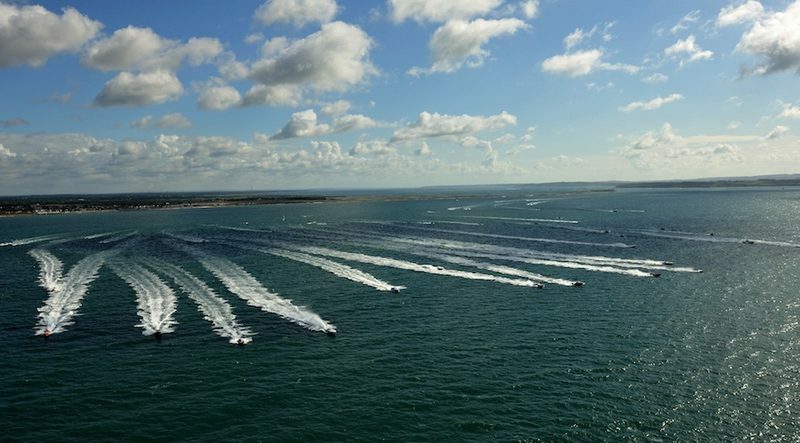 With an impressive fleet of 13 UIM Marathon boats set to take on the Cowes Torquay Cowes, the number of Cowes Poole Cowes entries surprised many. 18 teams have signed up, with 5 boats coming from the Channel Islands.